When I started hearing buzz about Color Factory in SF earlier this summer, I wanted to hate it, this thing that suddenly everyone in the design and crafty corners of my online social circle were drooling over, this thing that they, and by extension, I didn't really know much about, this thing that I quickly learned would cost me $32 to experience. It's a typical marketing strategy lately: create hype before there's any there there. And even my millennial coworker at my last gig admits that her generation is kind of known for queuing up for something just because there's a long line (e.g. chicken sandwiches at Bakesale Betty, a store that has a sad little website, no signage, limited hours, chronically long lines, and ironing board for tables...what can I say I'm not a fan of fried chicken). And I can't say I'm a huge fan of party supplies, per se (the driving force behind Color Factory). But then I heard Leah Rosenberg was providing creative direction. 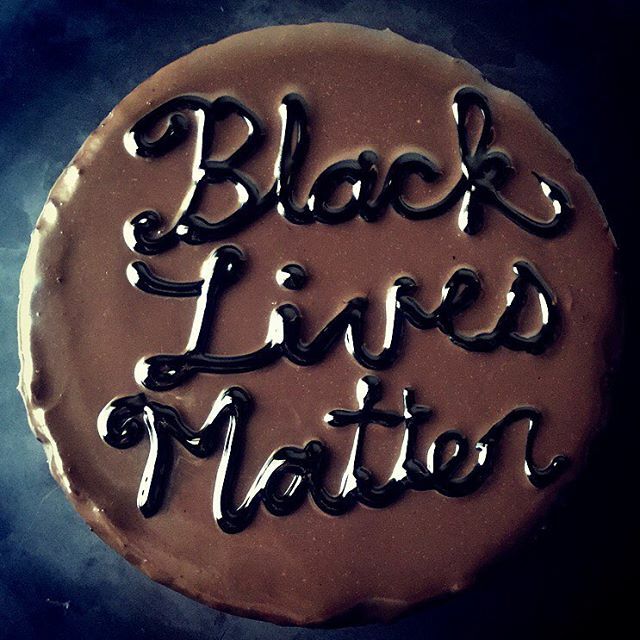 I admire her work as an artist who criss-crosses various media without apology, including cake. Yes, cake. Still, there was something about the project's insistence that it is not an art exhibit that turned me off (ironically, Color Factory is categorized as an "Art Museum" on Yelp). Even so, when September tickets opened up after August quickly sold out, I got lucky and nabbed a pair for this past Friday, my first day of temporary-unemployment-by-choice. I'd read Sarah Hotchkiss' (a CCA alum, like Rosenberg) review for KQED arts and I was, I'll admit, a hopeful convert. I will eat just about anything with a fried egg on top of it. 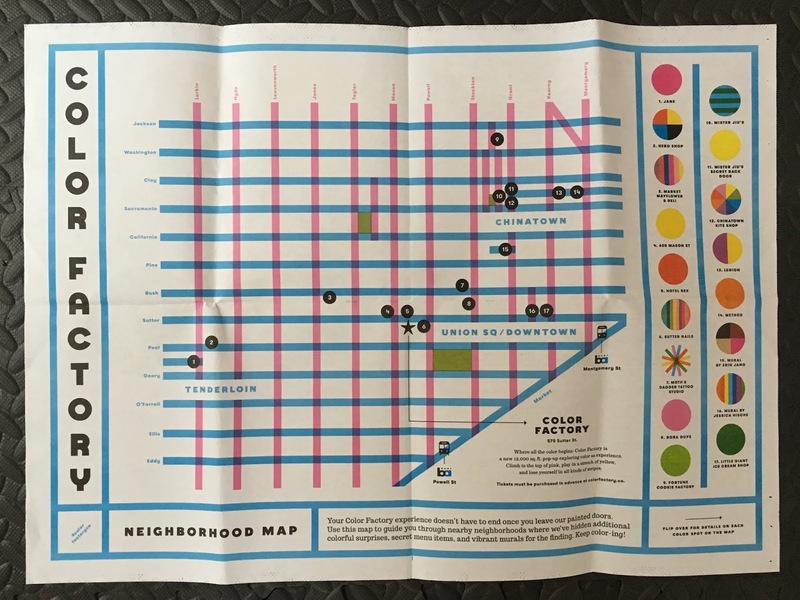 In a nutshell, though, the burrito I had from Tacorea for lunch after was more magical than the roughly 40 minutes we spent at Color Factory (much less time than I anticipated spending there). Don't get me wrong, it's not a bad experience. It's possible that going in the second month, and being a bit skeptical to begin with, is like seeing Titanic a month after it opened. I'd read so many rave reviews and seen so many gorgeous Instagram photos that there wasn't much in the way of surprises. And the most enjoyable parts for me were pretty front-loaded, like the scratch 'n' sniff wall dots in the first rainbow-striped room. Or sampling the sugary, pink marshmallows, followed by charcoal-infused lemonade. "This is going to be a full-sensory experience! ", I thought. But the richness of the Color Factory experience ended there for me. Sure, I felt a bit nostalgic in the orange room (cheez-its!). And the disco ball room was cool, but the audio experience should've been such that people were dancing, not laying down on the floor in order to get the optimally Instagrammable angle. 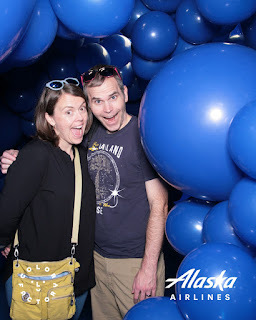 And in the blue balloon room, one of a few equipped with a camera that takes and sends pictures to your email address, you're reminded of the project's insistence that it's not an art exhibit. "In partnership with" Alaska Airlines and later, in the confetti room, "sponsored by" Method hand-soap - both tactics beg the question: why the steep ticket price if the experience isn't free of advertisements? If there's any kind of fourth wall in art-like experiences, these corporate elements definitely break that illusion, and not in a delightfully subversive way like when an actor speaks directly to the audience during a play. I'm simply reminded that I've been suckered into paying a lot of money for an experience not too far-fetched from something I might see someday soon in a particularly ambitious Target display. Additionally, certain elements could have been pushed further, like the all-pink bathrooms. How about a nice, vintage pink toilet and some pink toilet paper? And the two bathrooms upstairs? Missed opportunities to do something different, in the style of SFMoMA (I know, I know, it's not an art exhibit, sheesh!). Finally, yellow was definitely not my color last Friday. The ball pit ate my oft-complimented Old Navy sunglasses and the soft serve machine was busted. But I did stumble on a potential new response when people ask me what I do. Ultimately, while I admit that of course I took a bunch of photos and shared them via social media, the experience, like so many other Instagram-friendly not-necessarily-art experiences increasingly, is ultimately a building full of one-liner rooms, seemingly immune to any culture of critique (if you want to know what the difference is between art and, well, stuff like this, you're getting warmer). 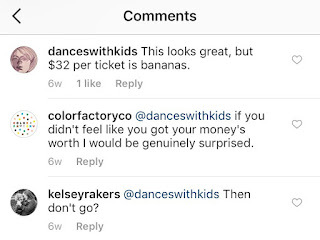 When I commented on Color Factory's post that $32 per person was bananas (bananas are yellow, get it? ), somebody else responded, simply, "Then don't go?" Yes, I suppose I could have expressed my criticism around how this project frames itself and at what cost by simply not participating? That's how capitalism works, after all. You support stuff with your hard-earned dollars. 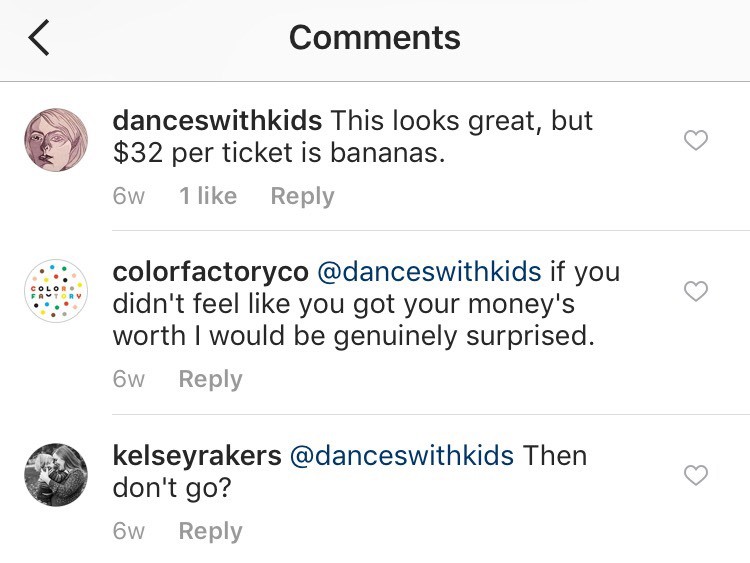 Do I feel like I got my money's worth (see Color Factory's response)? Well, I'm glad the edible experiences were included. At least there's that. Too bad about that soft-serve machine, though. Might have to Yelp about that now, too. 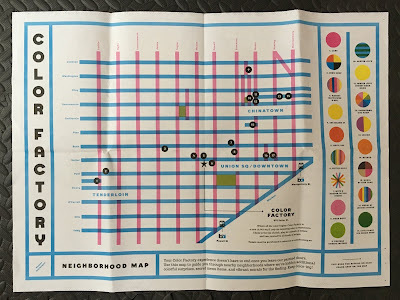 In all seriousness, one of my favorite parts is the one we didn't have time for - the map! I'll do this sometime soon with one or both kids, for free (at least, I think the scavenger hunt is free...).